The proposed affiliation between Cedars-Sinai and Torrance Memorial—first announced last May—became official Feb. 1. The affiliation will focus on new opportunities for coordination of care and resources between the two organizations, and joint programs to provide access to more people for needed medical services. This question-and-answer feature will help you get to know some of the faculty in the Cedars-Sinai Department of Surgery. This month's installment features Mark Vrahas, MD, chair of the Department of Orthopaedics. 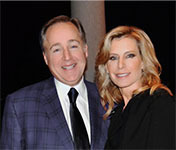 Cedars-Sinai has announced a $50 million gift from Eric and Susan Smidt and The Smidt Foundation to create the Smidt Heart Institute. The gift—the largest in Cedars-Sinai's 116-year history—will enable the hospital to expand its research and treatment of heart conditions by pursuing the most innovative science, advancing clinical trials and emerging treatments, and training the next generation of heart specialists. A new Advance Care Planning packet is available at nursing stations throughout the medical center, at outpatient clinics, and on both the Cedars-Sinai intranet and the Cedars-Sinai website. An Advance Healthcare Directive is a legal document that can be referred to in the event you are unable or don't want to participate in medical decisionmaking. Obesity and other common cardiovascular risk factors may play a greater role in sudden cardiac arrest among younger people than previously recognized, underscoring the importance of earlier screening, a Cedars-Sinai study has found. While sports activity often garners attention in cases of sudden cardiac arrest in younger patients, it was cited only in a small percentage of those ages 5 to 34 in the study, published in Circulation, a journal of the American Heart Association. Bishop William LaRue Dillard had been plagued by fits of coughing, trembling and shortness of breath for a while, but one morning he had a particularly frightening attack and decided he couldn't ignore them any longer. He was referred to the Smidt Heart Institute, where he received a lifesaving heart transplant at age 78. The Department of Surgery's Trauma Program reached a milestone in their support of the National Stop the Bleed (STB) Campaign in February. Mirta Siderman, a supervisor from COACH for Kids®, was the 500th person to attend a STB course. The Circle of Friends program honored 90 people in January. Circle of Friends allows grateful patients to make a donation in honor of the physicians, nurses, caregivers and others who have made a difference during their time at Cedars-Sinai. A specialized stenting system used to open blocked arteries in the brain resulted in a low complication rate among a specific group of patients with stroke histories, according to a study led by Cedars-Sinai researchers. The U.S. Food and Drug Administration has updated a warning about the antidepressant Pristiq (desvenlafaxine succinate) that it can lead to serotonin syndrome, a potentially life-threatening condition. The risk of suicidal thoughts and behaviors in pediatric and young adult patients is increased when used with other drugs that impair metabolism of serotonin. The U.S. Food and Drug Administration (FDA) is warning that the liver disease medicine Ocaliva (obeticholic acid) has been incorrectly dosed daily instead of weekly in patients with moderate-to-severe primary biliary cholangitis, a rare chronic liver disease. Also, in an effort to foster safe use of the over-the counter anti-diarrhea drug loperamide, the FDA is working with manufacturers to use blister packs or other single dose packaging, and to limit the number of doses in a package. With CS-Link™, refilling prescriptions is simple. If you want to accept prescriptions, click on the "accept all" button. If you don't have the "accept all" button on your toolbar, you also can find it under "more." Also, it's easy to move the button to your toolbar.